It was a somewhat rainy morning today and Spencer had his soccer game. Nate was not enjoying the fact that he was getting wet. 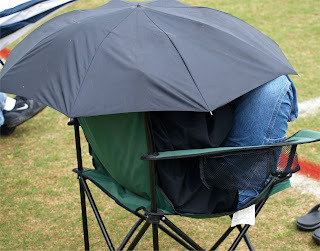 He was trying every thing to keep himself dry. 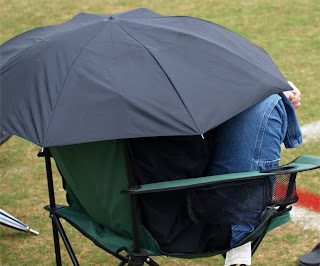 First he just scrunched down a little under the umbrella to keep the rain away. 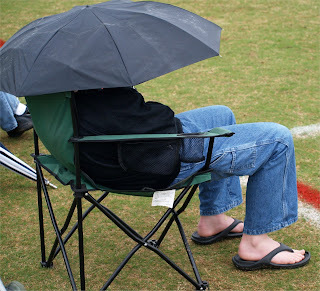 Then a few minutes later, the rain coming down a bit harder and I notice him attempting to tuck his feet under himself. I just began to chuckle to myself. I look over again and sure enough he was able to tuck them underneath himself. A look of surprise washes over my face. Note: He was able to keep a bit of the rain off of him.